Anyone who owns tile flooring or other surfaces appreciates just how easy it is to wipe up spills and get things looking nice and clean. But although it is usually easy to wipe up a spill, you also discover fairly quickly with tile that the grout between the tiles presents a whole other problem. Material that gets in the grout can seem virtually impossible to remove. At Chad’s Carpet Care, we offer you an effective way to clean both your tile and your grout. 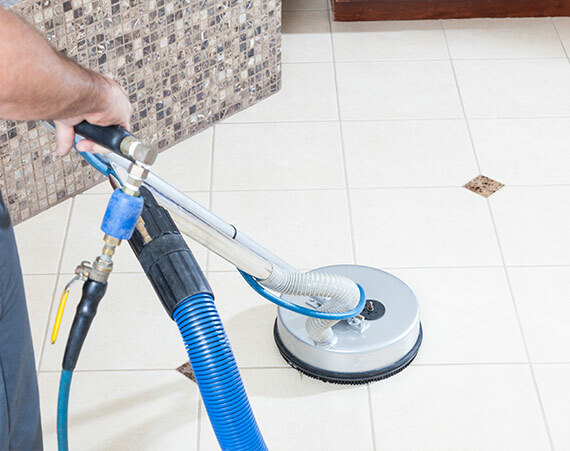 Our cleaning team uses the latest cleaning technologies and proven cleaning methods to remove dirt and other contaminants from the porous grout material. We can get the tile looking bright and beautiful, and the grout along with it. Grout can be incredibly frustrating to clean on your own. If you look closely and run your finger along the grout, you will see why this is the case. Grout is rough and porous. It easily absorbs dirt, stains, mold and bacteria. You can scrub away at it, but to really get the material out of the grout you would have to scrub off a considerable amount, enough to possibly destroy the integrity of the grout and cause the tile to become loose. Grout is awesome at holding tiles in place. It is also awesome at getting dirty. The only way to really get it clean is through professional grout cleaning. When we come to your home to clean your tile surfaces, we will take a close look at the tile and the grout. Our services are always tailored to your specific needs, so we will carefully consider the best way to approach the task. If necessary, we will pre-treat any stains. Then we will use the most appropriate method for cleaning both the tile and the grout. Our cleaning methods can be used on most any tile surface, including porcelain, ceramic and stone tiles. We can clean your kitchen, your bathroom and any other tiled areas in your home. When we are done, we promise that you will be impressed with the results. Tile surfaces are often found in areas of the home that need to be clean in order to remain health, such as kitchens and bathrooms. Professional cleaning ensures that all contaminants, including dirt, bacteria, mold and allergens are removed from these sensitive areas. Let’s face it – dirty, stained tile and grout looks bad. It makes your kitchen and bathroom look dirty, which can be really frustrating after you have just spent several hours scrubbing. Professional cleaning brings back the clean look, and makes it much easier for you to keep it looking clean. Contaminants can cause grout to break down and degrade over time. By having the surfaces professionally cleaned, you are extending their life and avoiding the need for expensive replacement. If you live in the South Houston or Galveston area, we can help you get your tile surfaces looking great again. Please contact us whenever is convenient and schedule a cleaning. We are here to help!